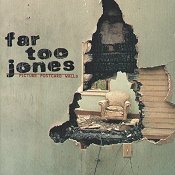 Hailing from Raleigh, North Carolina, Far Too Jones is a five-piece pop-rock act. On their first release for Mammoth Records, and second full-length, they have a few bright moments surrounded by otherwise run-of-the-mill modern rock. One thing, though, that works in their favor is their diversity. They do manage to keep each song slightly different, bringing in different instruments and influences to achieve this. "Falling Back Down" is a muscled rock number that possess enough amped up guitars, rock-solid bass lines, and hammering drums to keep the momentum flowing. Starting off with a charged attitude from the beginning, the power quickly flows into your body and revs you up. Slippery hooks are conveniently placed in, allowing you to slide right into them. Within a minute of the song, the guitars will rope you in, while the vocals start pounding on your head. "Close To You" shows another side of the band. Lead by an acoustic guitar, they begin to settle back down into their pop-rock foundation, leaning more towards the pop side than their rock alter-ego. The beautiful combination of an acoustic guitar and a cello will instantly strike a chord with you, reeling you in and wrapping a musical blanket around you, while the drums and bass help give the song a deeper, stronger sound. Together, they're able to serve up a soft number that has enough force to stir up a reaction from the listener. Another good song on this album, "Look At You Now," possesses a few lines that will instantly jump out at you and grab your attention. "And I know you, you're always the stupid one. Had to bring a loaded gun. Your apathy kills. The black girls swear you're the coolest white girl around," which opens the song, just happens to burn a vivid imagine inside your head about the person they're describing, and, following up with a few choice hooks, they have you hooked. Blending the rock spirit of "Falling Back Down," with the emotional, down-to-earth pop feel of "Close To You," this song describes a middle ground in which Far Too Jones seems to be at their best. A fairly new band, Far Too Jones has the tools to write catchy pop-rock tunes. However, on this album they seemed to be over burdened with this fact and lose themselves along the way. A decent rock album, it is a fairly lifeless. They just need to follow through with more cuts like the three described above. I'll give this disc a B-.